Rare Bird Books, a Vireo Book, 9781945572449, 296pp. A novel of U.S. politics, clean and dirty, and the ways in which the specter of the past informs our every move. Ben Shamas, a gifted lawyer whose daughter's death in a boating accident has led him toward self-destruction, is tapped by a friend and old Yale classmate to help with his Midwest campaign for the U.S. Senate. Bobby Parrish is a principled and serious candidate who doesn't expect Ben to coopt his opponent's dirty playbook. 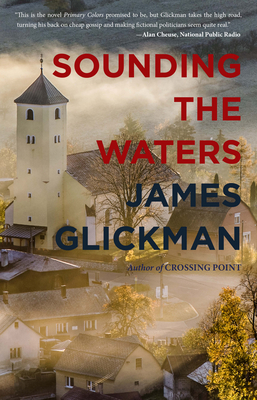 James Glickman's impressive debut novel burst onto the scene to much acclaim in the mid-90s. Now for the first time in paperback, it is available to a new audience and more pressing than ever. James Glickman is a graduate of Yale University and the Iowa Writers' Workshop. His fiction and nonfiction writings appeared in The Boston Globe, Redbook, Ladies Home Journal, Berfrois, and many others. His first novel Sounding the Waters came out in 1996 to wide acclaim. Crossing Point is his second novel. He lives in Massachusetts.